Environmental reporting and communication – “Show me the evidence”! Puig, M. [et al.]. 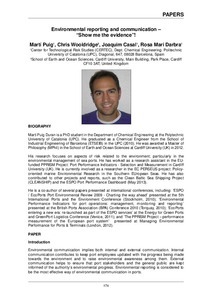 Environmental reporting and communication – “Show me the evidence”!. A: GreenPort Congress. "2013 GreenPort Congress". Antwerp: 2013, p. 168-177.